Until that time it was only available on Android, alternative keyboard SwiftKey now supports iOS. SwiftKey Note is available for free. It can save time at a moment when the schedules of school are loaded. This app adapts to the way you write. It takes into account the context in which you write, memorize words and phrases you use most often. It includes the editor and is able - via its predictive text system - proposing the end of words or the end of a sentence with the correct spelling. While all of this is automatic, printing personalization dominates. 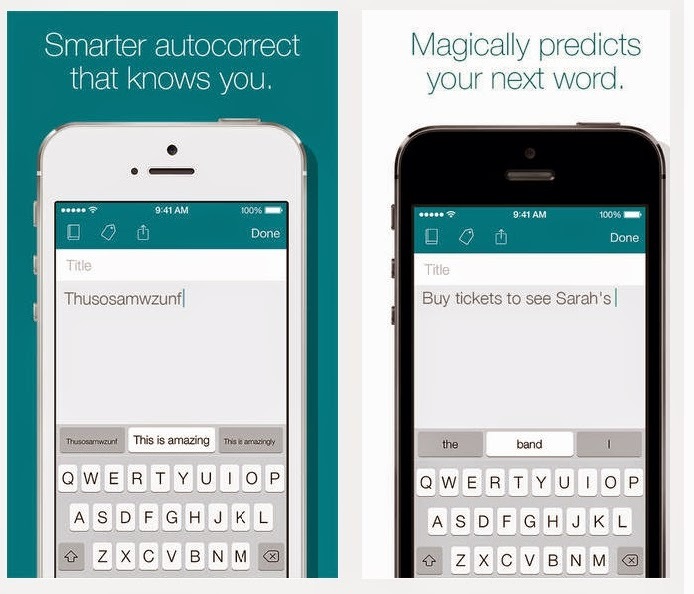 Word associations like you and you type more than the app matures and gains precision in its suggestion of words. You can record and share your thoughts via the notebook. With even more ease than you now type quickly without losing your train of thought, at the keyboard. Your feedback is classified and labeled by category. You will find them in one click and can share them via Facebook, Twitter, AirDrop. Besides its compatibility with the iOS environment, SwiftKey Note can be synchronized with Evernote account both for saving notes for learning knowledge base from your previously written. In addition, the landscape mode, more readable, is now supported on all devices. Also, if you want to improve, you can measure your effectiveness by analyzing, for example, the number of keystrokes and less and spelling errors corrected.